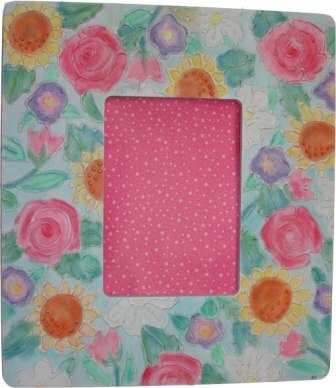 Use a special glue embossing technique to create a floral picture frame perfect for a baby room or garden decor. This makes a wonderful gift with eye-catching colors. This project comes to us compliments of Heidi Borchers of Inspired at Home. You can also listen to this project as you craft, read by Heidi Borchers. Draw design onto frame with pencil. Place a tape nozzle onto the bottle of glue. See technique for help with this. Draw with glue along the pencil lines. Let dry completely. Spray paint the entire frame and dried glue with white spray paint. Let dry. To color with chalk, rub the brush over the surface of the chalk, then rub onto frame where desired. Continue to add different colors of chalk to the frame until entire design is chalked. Spray entire chalked surface with spray fixative. Heidi’s Designer Tip: To keep your chalk colors bright, be sure to wipe off the brush with the paper towel between colors. This will keep your colors from becoming “muddy”.